Another very popular EKOL Blank gun just made it into the Replica Airgun Store, and this one has selectable Full Auto! 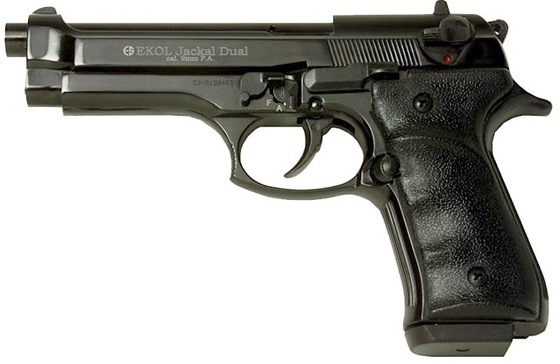 The EKOL Jackal Dual looks like the EKOL Firat and both of them look like the popular Beretta 92FS semi auto pistol. When I got my EKOl Firat a while back with a bunch of other fine EKOL products, I decided to not do a full review on it as it is essentially the same gun as my EKOL Jackal. Well, the people have spoken and I have given into the pressure and made a short comparison video on the differences between the EKOL Jackal and the EKOL Firat. The Blank EKOL guns in this video are represented in both the Magnum (EKOL Jackal) and Compact (EKOL Firat) sizes which will also help you get an idea of the size difference when ordering as both guns can be purchased in Magnum and Compact versions. The EKOL Jackal can shoot in both semi auto and full auto while the EKOL Firat is semi auto only. The EKOL Jackal's rear safety is non-functioning for all intents and purposes as the semi-full auto selector switch is also used as a safety switch. The EKOL Firat uses the rear safety as its safety and it is fully functional. The EKOL Firat is about $60 less expensive as it does not have the full auto feature. 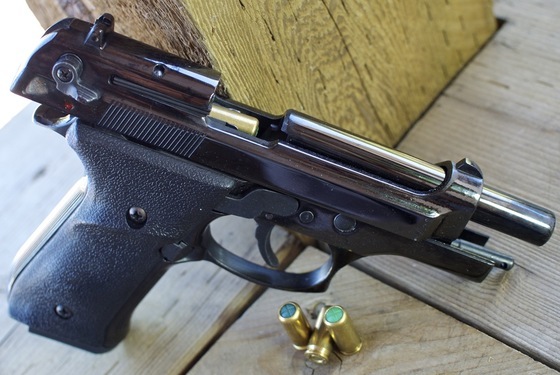 Trigger Pull: The trigger pull of the Jackal Dual is typical of a single action semi auto gun, no hammer pull is required so it has a light to medium pull. Build Quality: The build quality is similar to that of my Zoraki blank guns. The EKOL Jackal Dual is well built and uses good quality materials, this gun is almost all metal and very heavy with thick materials. The finish quality is typical of other Turkish guns - good but not perfect. Out of all the EKOL finishes, the black (which is more of glossy back) is probably the nicest. Realism: The Jackal Dual is an almost exact copy of the Beretta 92FS, it would be hard to tell them apart from any distance. Very good construction, lots of metal parts and good solid weight to the Jackal. The black gloss finish is one of the nicer EKOL finishes. 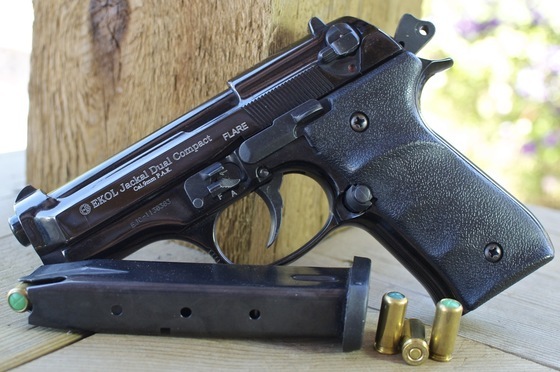 If you own a Beretta 92FS or plan to get one, the Jackal would make a great trainer to accompany your real one. The rear safety is non-functional and a bit confusing. 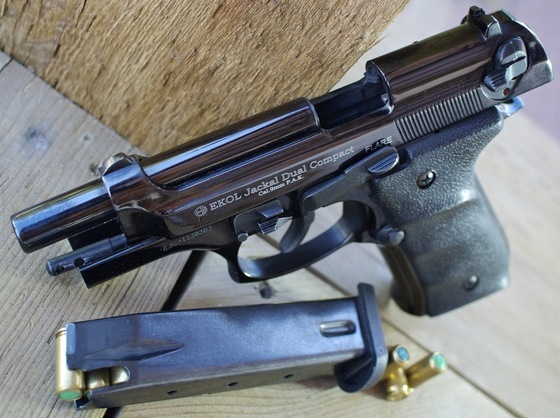 The EKOL Jackal Dual blank gun is a nice addition to our growing number of legal blank guns in Canada. EKOL offers a nice variety of models to choose from with an assortment of finishes. 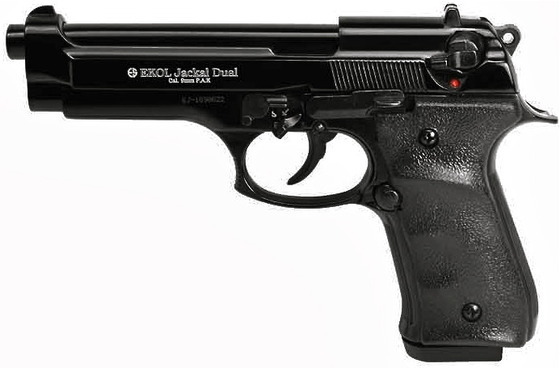 Out of all the EKOL guns, I would consider the Jackal Dual as being the most realistic as it is really a copy of the Beretta 92FS. The quality and finish is pretty good overall with the usual few minimal imperfection found on many Turkish blank guns. This gun test fired without incident. I shoot 10 rounds through it and had no miss fires, failures to load or eject. The full auto feature of this gun makes it very thrilling to shoot, just make sure you have lots of ammo with you and an out of the way place to shoot.